Este apartamento de dos dormitorios está ubicado en el primer piso (la convención británica) de una casa familiar de 3 pisos. El apartamento puede alojar hasta cinco personas, ya que está amueblado con una cama doble, dos camas individuales y un sofá cama. El equipamiento del piso incluye cocina, lavadora, aire acondicionado. Proporcionamos suministros como aceite, sal, azúcar, café, té, etc. Ropa de cama, toallas, jabón de manos, gel de ducha y champú también se proporcionan a todos nuestros huéspedes. Este apartamento tiene acceso a la gran terraza con sombra (50 m2 / 540 pies cuadrados) amueblada con mesa y sillas. La terraza es compartida con nuestro otro apartamento. La hora de registro es después de las 14:00, pero somos flexibles al respecto, dependiendo de las salidas de otros huéspedes. Puede llegar antes de la hora de check-in y dejar su equipaje en nuestro lugar, y explorar el área alrededor hasta que el lugar esté listo. La hora de salida es hasta las 10:00, pero también puede dejar su equipaje en nuestro lugar hasta su salida de Dubrovnik. Según la disponibilidad, podemos ofrecerle nuestro garaje para estacionar su automóvil durante su estadía sin cargo (se requiere reservación). Solo requeriríamos un depósito reembolsable de 50 euros o 400 kunas para el control remoto (se lo entregamos a la llegada y lo devolvemos a la salida). También se ofrece aparcamiento gratuito en la calle. El apartamento se corresponde con lo publicitado. A good friendly welcome. Clean and tidy with everything we needed. Unseasonably hot so needed the air conditioning (lounge only). 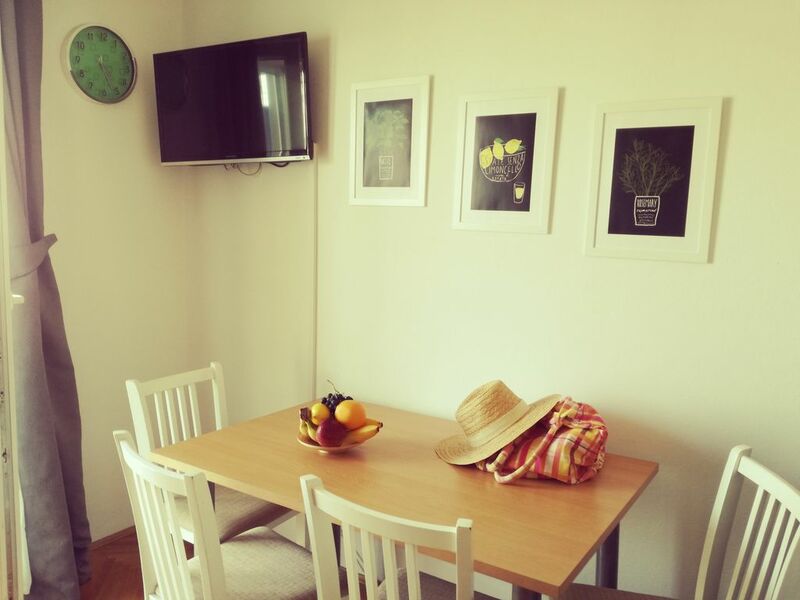 The apt is in Lapad close to the beach in walking distance and not too far from the old town. It's really difficult to park around there but luckily the owner has a garage also. The property was clean, silent and well equipped and big enough to host 4 people comfortably. The owner was very nice to us and helpful. If you're searching a normal way of living far touristic places this is the place to be! Nice little apartment run by very friendly people! I was visiting Dubrovnik with a friend, and it was a struggle to find a place to stay that would guarantee separate beds that wasn’t unreasonably priced! Then I stumbled across this apartment which would allow us to have separate rooms for our 4 night stay. I didn’t know an awful lot about Dubrovnik before visiting aside from the old town being the place we had to visit, so I was a little concerned when booking the apartment that it wasn’t in the old town vicinity. However, I’d have no problem staying here again – there’s an easy bus around 5 minutes walk away that connects the ‘new town’ of Lapad to the old town, and actually many of the activities we booked ended up being Lapad based anyway, so there really was no issue in the location. You are 5 minutes walk away from a strip of restaurants and bars, 5 minutes walk away from the port where many boat trips and watersports are based, yet you’re tucked away in a quiet area so there is no noise around the apartment. Aside from the location and personal space, there were a couple of other major things I appreciated with this apartment. As others have commented, the people who run this apartment are great, and they’ll meet with you on the first night to ensure you can find your way around. They’ll also give you suggestions on things to do or places to eat at if you want them. And they’ll go out of their way to ensure your trip goes smoothly – thank you Martina for taking us back to the airport and feeding us chocolate brownies! I also really appreciated the air conditioning, which meant we could cool the flat down in the evening and have a decent night’s sleep – it’s not too noisy that you can’t have it on overnight, and makes a big difference. Overall, if you’re looking for a place to stay in Dubrovnik, this is definitely a good option, run by very nice people who want to go the extra mile. Enjoy Dubrovnik, it’s a great city! Nice apartment, very well located, close to the sea and a big shopping street, with restaurant and bars.